Who can play Metro USTA Jr. Team Tennis? How do I know which Play Level I should sign up for? What is the cost to play Metro USTA Jr. Team Tennis? What type of scoring is used? How long does league play last? Who are the captains for Jr. Team Tennis? What if my question regarding USTA Jr. team tennis has not been answered? 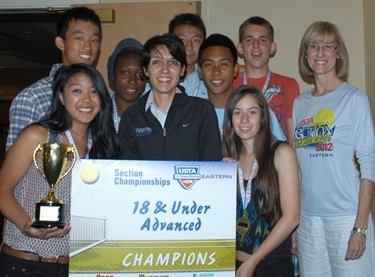 Any current USTA member ages 7-18 years old living in the Metro New York region is eligible for participation. We welcome players from all skill levels. They are divided by the following age and play levels: Age Groups: 18 & Under, 14 & Under, 12 & Under, 10 & Under and 8 & Under. Play Levels: Intermediate, Advanced. USTA membership and league fees are required. USTA Jr. Membership fee starts at $20. To find out more information about membership visit: http://membership.usta.com. Teams in the 12U, 14U AND 18U divisions are co-ed and will consist of a minimum of eight (8) players (4 boys and 4 girls). 10U and 8U teams will consist of 6-8 players (of either gender). In addition to age, players are grouped by skill level. A player may play up in age division (if skill level is appropriate), but not below their age division or skill level. 12U, 14U, AND 18U divisions will be co-ed teams. Team matches will consist of five individual matches; one line each of boys' singles, girls' singles, boys' doubles, girls' doubles, and mixed doubles. Team matches for 10U and 8U divisions will be two lines of singles and two lines of doubles (non gender specific). The season will be a round robin, each team playing every other team in its division at least once. For 18U, 14U and 12U - Timed matches: 30 minutes each, 8-game cap. We encourage parents to participate. Every team needs a captain and preferably a co-captain to help disseminate information, organize line-ups and report scores. Tennis experience is not necessary. However, all captains and/or co-captains must submit to the criminal background check offered by USTA Eastern. There are several ways to become part of a team. You may form a team of juniors in the proper age and skill level and register them on Tennislink. You may contact Esu Ma’at, Tennis Service Representative, Metro Region, 914-216-5691. The season will last approximately 12 weeks, depending on the number of teams registered in each division. Select Saturdays from January 2015 – April 2015. USTA Billie Jean King National Tennis Center, 5:30pm-7:30pm, Harlem Tennis Center 1pm-3pm. Additional locations may be added if needed. Our captains can be Coaches or Parents. Captains are NOT REQUIRED to be USTA members or to teach tennis skills. Contact the Metro Jr. Team Tennis Coordinator, if you would like to captain a team or get additional information regarding captaining. Contact the Metro Jr. Team Tennis Coordinator, via e-mail at metrojtt@gmail.com or visit the USTA Website.